The United States has comprehensive and up-to-date laws for e-commerce, electronic signatures, and cybercrime. The United States has signed and implemented the Convention on Cybercrime and plays a leading role in the investigation of global cybercrimes. Although there are no general privacy laws in place, the United States does have useful sectoral privacy laws and an active regulator. There is an ongoing debate in the US regarding the balance between national security surveillance and privacy protection. There are numerous, but inconsistent, state data breach notification laws in place in the United States. 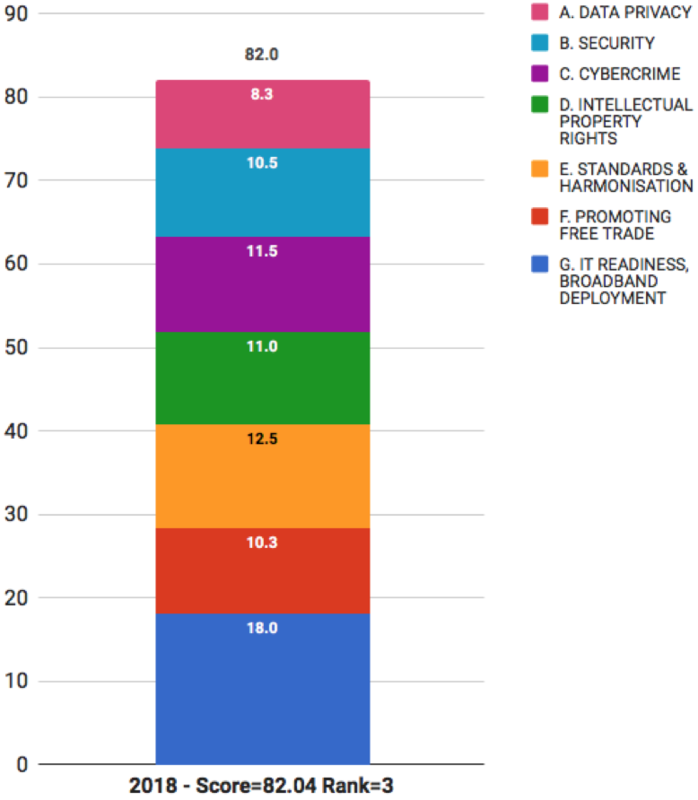 The United States scores well in the intellectual property section of the report. The country has signed all of the relevant international agreements, and a strong intellectual property enforcement culture is in place. The United States is an active participant in international standards development processes and an advocate of free trade and harmonization. The United States has high levels of Internet use, but access to fast broadband remains patchy. The National Broadband Plan has a goal that by 2020 at least 100 million households will have download speeds of 100 Mbps and upload speeds of 50 Mbps. Not all parts of the plan have been adopted or fully funded; however, significant parts of the plan have been implemented. The United States’ position in the 2018 Scorecard rankings fell slightly — from second to third. - 6th for IT readiness and broadband deployment.